2amsomewhere: What Have I Been Up To? The graph you see above depict the lines of source code attributed to each developer within the company. The dark blue line is my boss. The light blue line is me. That red line that has an abrupt halt in mid-March is the co-worker that got the axe a couple months ago. This graph doesn't tell the full story, because I have another 14,935 lines checked in on a separate web service source repository. The bulk of that code was written in the first half of 2008. For the month of April, my code count was 8,163. That marked a new record for me. Prior to that, my highest throughput was 3,815, recorded March of this year. 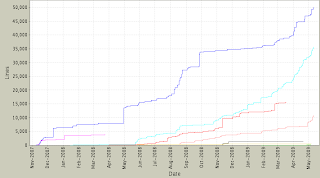 If things don't slow down, I will be on pace to shatter the April's total because I've checked in a net of 3,740 lines. While it feels good to be productive, I am pretty sure this rate is not sustainable.